CLINAM · 2010, Levy L. et al. Nano Publications > Congress Abstracts > Miscellaneous > 2010 – CLINAM Abstract – Expected and Unexpected Side Effects of Nanodrugs – Levy et al. The “principle of designing” specific products is the paradigm of the nanomedecine. 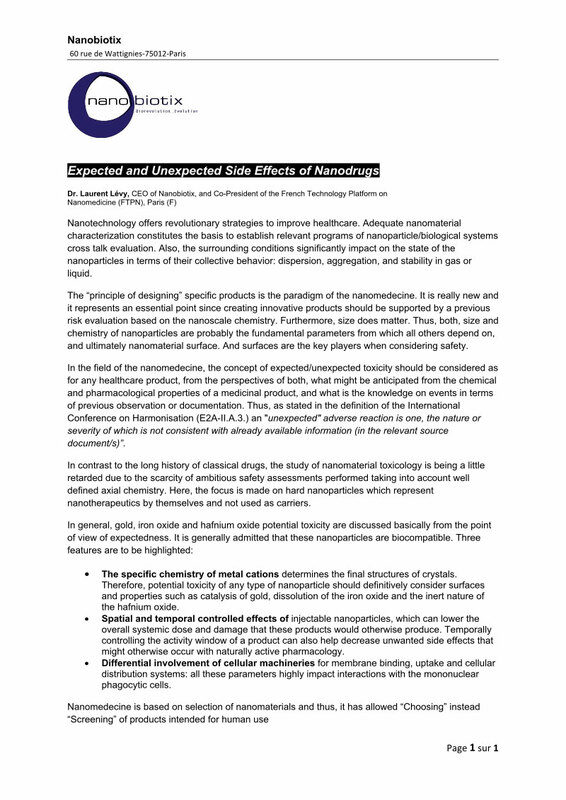 It is really new and it represents an essential point since creating innovative products should be supported by a previous risk evaluation based on the nanoscale chemistry. Furthermore, size does matter. Thus, both, size and chemistry of nanoparticles are probably the fundamental parameters from which all others depend on, and ultimately nanomaterial surface. And surfaces are the key players when considering safety.